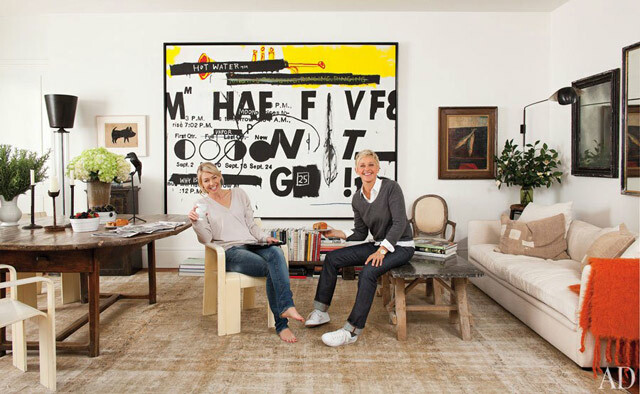 ABOVE: Actress Portia de Rossi and talk show host Ellen DeGeneres in the sitting area of their Beverly Hills house. The large painting behind the couple is an Andy Warhol and Jean-Michel Basquiat collaboration, and the drawing to its left is by Bill Traylor. 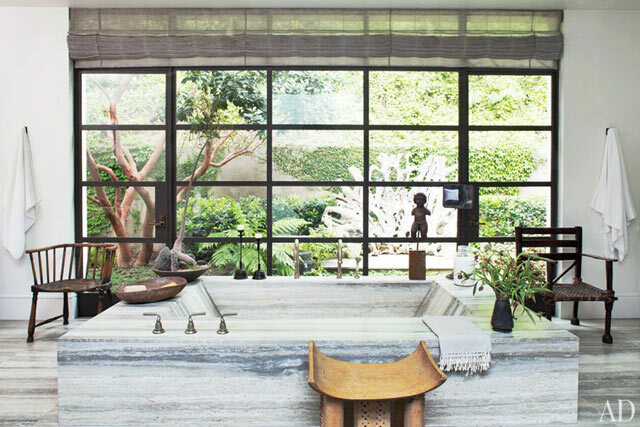 Talk show host Ellen DeGeneres and her wife Portia de Rossi allowed Architectural Digest into their home in 2011 and what the magazine found was that these design-savvy stars had transformed a Beverly Hills estate into a perfect home. 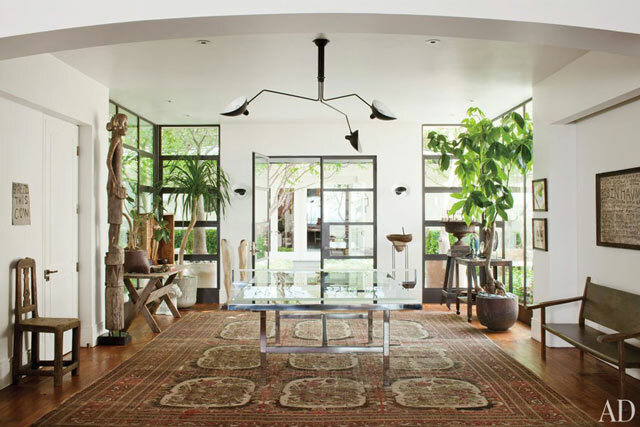 The living room’s vintage library ladder displays a mask from DeGeneres’s collection of African art. 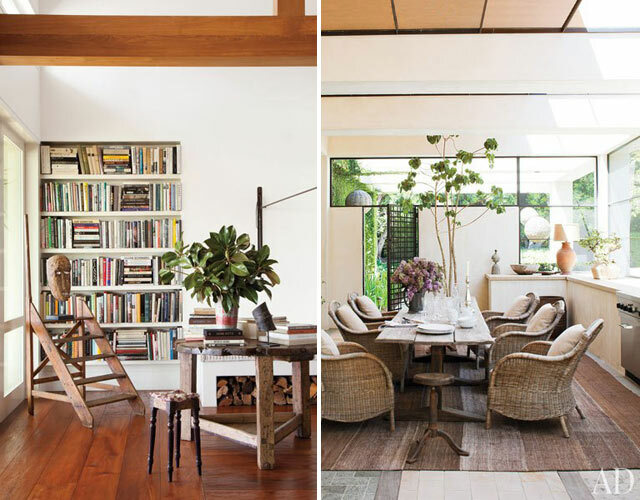 To the right you'll see the screened porch DeGeneres and De Rossi added to the home, where a 19th-century trestle table is paired with wicker armchairs. The big marble tub overlooks a private garden, making it the perfect spot for soaking and relaxing! The bathroom (left) features many elegant surfaces, like marble floors and limestone countertops. The mirror adds depth to the room and the patterned frame adds an interesting touch. 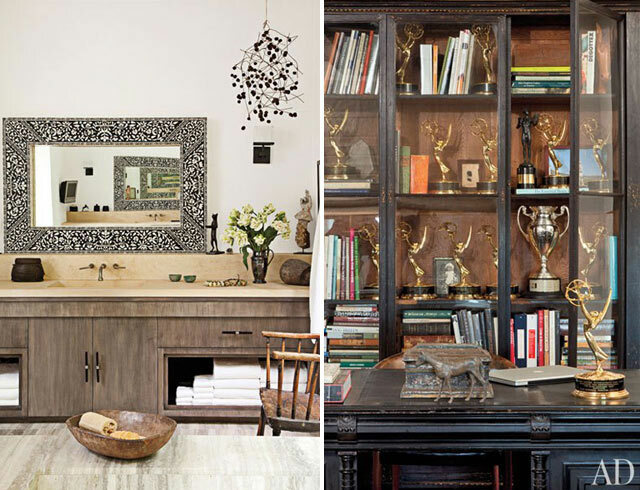 On the right you'll see Ellen keeps her Emmy awards in a 19th-century cabinet in her office. The master bedroom features earthy tones and a custom-made bed topped with an antique French textile. The walls are upholstered in gray flannel, giving the room a bit of texture and warmth that a bedroom needs. 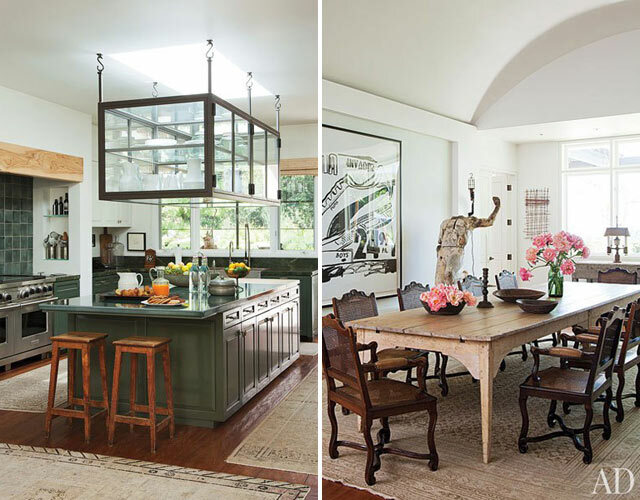 In the kitchen (left) you'll find a custom-made glass display case that stores tableware. The rustic floor is up-cycled from reclaimed teak beams from China, while the rugs are antique. 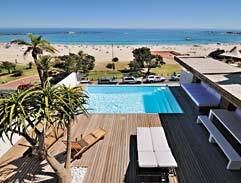 The big pool has a beautiful view of the surrounding are. On the left an amazing skylight in this room fills it with natural light. 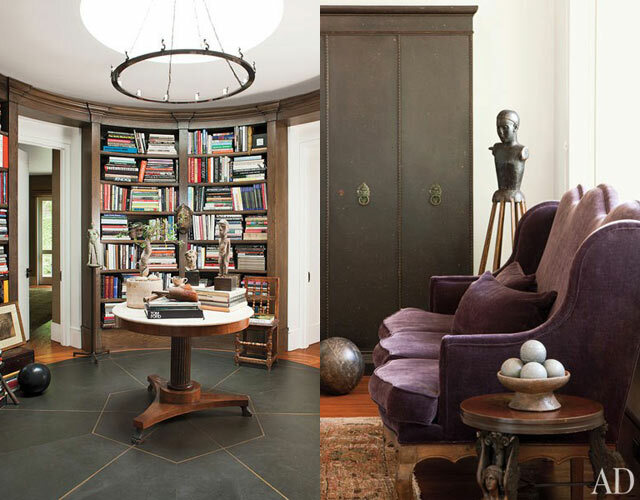 In the corner of the office (pictured right), a vintage industrial cabinet, a wingback settee and an 18th-century Italian santo figure add sophisticated touches to the room. A clear Ping-Pong table is a fun edition to the entrance hall, while the modern chandelier, plants and rug tie the room together. The fireplace in the living room is definitely a feature that stands out, along with the carefully selected art and unique furniture. 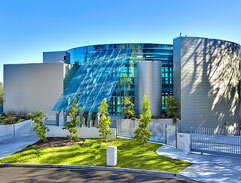 Take a peek inside Justin Bieber's new glass mansion in Beverly Hills. 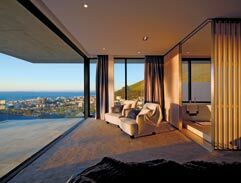 Sandwiched between a bounty of nature, breathtaking views liberate a tightly packaged spot of Atlantic seaboard. Appearing to strut from the mountains to the ocean, this luxurious Stefan Antoni Olmesdahl Truen-designed home welcomes its surrounding landscape.